Recipe by rebecca moore / institute for animal happiness! Equipment: We used a toaster oven that fits two pies for baking at a time. And a good blender, preferably high speed, is great. Heads’ up: We didn’t scale the recipe down. You are going to want to make all four and share with friends. 1/2 to 1 cup yellow onion, roughly chopped, doesn’t need to be perfectly done. Four frozen vegan pie crusts (They usually come two-to-a-package; defrost before baking). Vegan ones are out there! You can also use a gluten-free variety, or even make pie crusts from scratch if you are an over-achiever. Your favorite Vegan Shreds. We also love Follow Your Heart Shredded Mozzarella. 1. Cook pasta as directed on the package in salted water, until al dente. Drain, put in a nice large bowl and toss in some VEGAN BUTTER just to coat the pasta liberally and keep the pasta from sticking together… and set aside. You will use that nice big bowl to mix EVERYTHING into, eventually. 2. Cook butternut squash in boiling water for 15-20 minutes, until tender. Drain and set aside. 3. Cook cashews in boiling water for 15 minutes. Drain and set aside. 4. Sauté the onions and garlic in a bit of oil until onions are translucent and garlic is softer and brown. 5. Into the nice large bowl of buttered elbow pasta, add 4 cups of the cooked cubed butternut squash. 6. Place ALL THE OTHER remaining ingredients - - - - EXCEPT THE PARMESAN SHREDS, VEGAN “EGG REPLACER” EGG MIXTURE, SRIRACHA, AND ANY OF YOUR OPTIONAL ADD-INS - - - - into a high-powered blender or food processor, and blend until super creamy. You may have to start with half of the ingredients and add in the rest slowly, so it fully pulverizes. This is your cream sauce base. 7. Pour the creamy “cheeze” sauce mixture into the big bowl with the macaroni and butternut squash and gently mix well to coat. THIS is where you add in the Egg-replacer “egg” mixture, a dash or two of Sriracha, a cup or so of Shredded Parmesan, and any other vegan shredded cheeses. Don’t over-do it with all the shreds; just a cup or so of each will be enough. 8. Pour this mac-and-cheeze mixture into your four de-frosted pie crusts (NOTE: If you want the cheese strips on the bottom, lay them in first! You can also first pour in the mac-and-cheeze mixture to cover the bottom of the crust and create a “mid-layer” of the cheeze strips, and then pour more of the macaroni mixture on top!) Fill each pie crust so it is nice and full! 9. Coat the top of each pie with a good shake of bread crumbs. 10. Cover each of the four pies with tin foil and bake them each (or all together, if you have a big oven) for about 30 minutes at 400 degrees; At that point, remove the foil and bake an additional 5–10 minutes or until top is a nice golden brown. Keep an eye on it - don’t let the crust burn! You want the top to have a toasty color and crispiness to it. After you try it once and get the basics, you’ll see how easy this recipe is and then you can experiment with adding different veggies: corn kernels, finely chopped spinach or kale… Your favorite vegan “faux bacon” (chopped into tiny bits) can give a nice added texture and flavor. 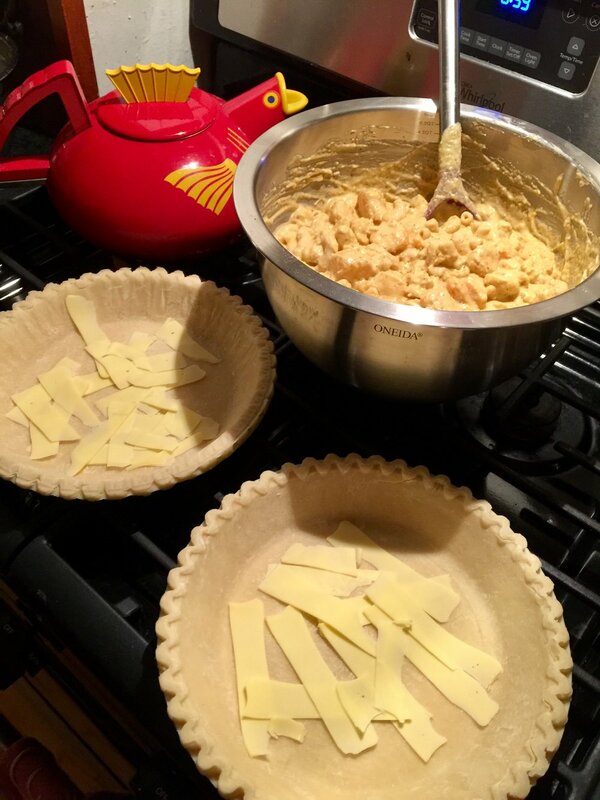 Sprinkle some into the whole noodle/cheeze sauce batch before filling the pie crusts… or even folding the mac and cheese mixture inside some PUFF PASTRY and baking it would be delicious. You actually don’t need a pie crust or anything at all… you can just bake this in a greased, rectangular baking dish (the type used for lasagna)… YUM! LET IT COOL AND SET. You can eat it asap if you want after baking - no self-control necessary! 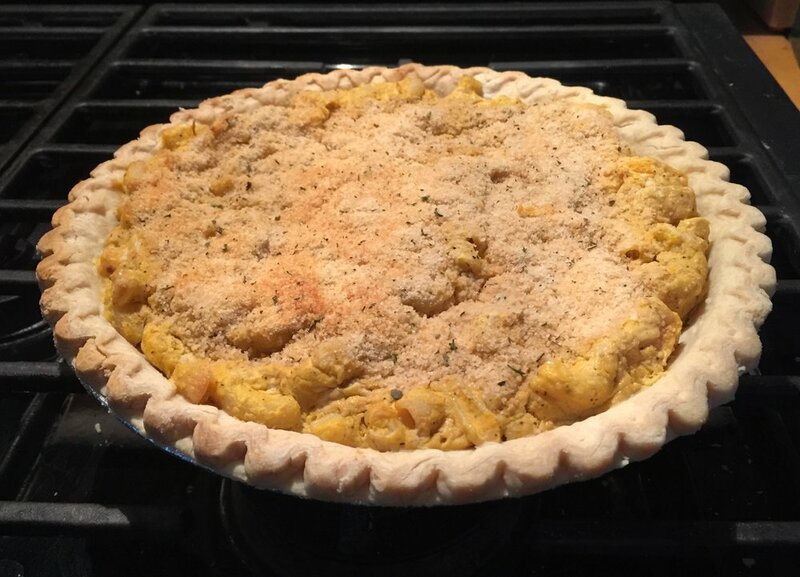 But it will definitely be all gooey and fall apart and behave just like any mac-and-cheeze - except it will have the delicious bits of pie crust in and around it! But if you make it the day before you are going to eat it, and really let this set, it firms up fantastically overnight and will serve beautifully at your next pot luck gathering. Share this with friends. It is the best comfort food and will warm your friends’ hearts. Vegans or those just trying vegan a-new: please buy fair-trade/fair-wage/organic/non-gmo ingredients wherever possible! As much as possible. All the time if possible. Because: we are vegan to make a more compassionate world, and caring about animals AND people is ALL O’ THAT!